Hosting in-salon gatherings can help attract new clients and keep current ones happy, say American Salon’s Better Business Network members. Like attracts like—that’s the motto Paul Pontillo, owner of Paul James Salon in West Palm Beach, FL, goes by when hosting in-salon functions. Inviting the salon’s A-list clients and encouraging them to bring a guest helps him garner new like-minded clients, he says. At least three times a year, he invites 50 to 100 of his most frequent customers, like color clients, to product-launch events. There, the guests enjoy free drinks, food, services and products. Pontillo says these gatherings offer many benefits like meeting potential new clients, keeping the top guests happy and generating more retail sales by creating buzz around new products. Pontillo’s motto about like attracting like also applies to partnering with companies to host events. “When you share a goal, you generally have a better relationship,” he says. “We have a similar cause, and it’s not ourselves.” Paul James Salon pairs with businesses, including a local furniture store, to host silent auctions in which both companies sell their products and donate the proceeds to The Lord’s Place, an organization dedicated to ending homelessness. 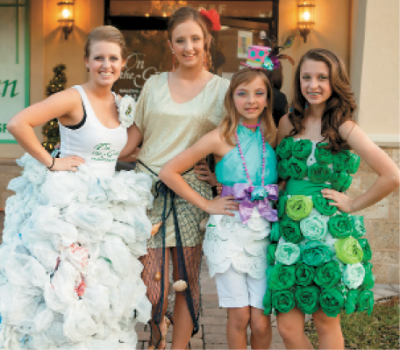 On The Green Salon and Day Spa in St. Marys, GA hosts several salon events including a Trashion Fashion Show for Aveda Earth Month. Kellie Johnson, owner of Elan Hair Studio in Sea Girt, NJ, recommends partnering with a business that complements the event and the salon’s services. She has partnered with local florists for wedding events and certified health coaches for wellness events. “It has to be mutually beneficial,” she says. Johnson also emphasizes the value of sending thank-you cards to guests of events and offering promotions to entice them to return. “We measure the success of the event by sales the day/night of, and the appointments that are pre-booked,” she adds.